ATLANTA, Ga. --- Leonardo and Nakanihon Air Service, Co., Ltd. of Japan (Nakanihon Air Service) signed at Heli-Expo a Memorandum of Understanding (MoU) to establish a joint working group that will study requirements for introducing the AW609 commercial multirole tiltrotor into service in Japan. Leonardo already supplies a range of advanced rotorcraft technology to the benefit of Japanese civil and government users. 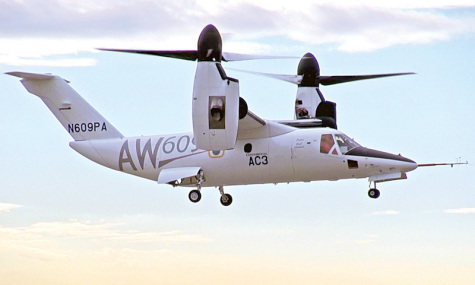 The AW609 represents the next generation of aircraft transport under the all-new, rigorous power lift civil certification category being set by FAA, and is now entering the mass production phase at Leonardo Philadelphia facility. In line with market interest, the AW609 first Full Motion simulator will be available in 2020. Thanks to turboprop-like speed, a 25,000 ft altitude and 2,000 km maximum range, users will benefit from unique flying capabilities above adverse weather and a pressurized cabin for maximized comfort and patient medical treatment, while maintaining rotorcraft vertical take-off and landing / hovering versatility. During the next 12 months, the working group will leverage the Nakanihon Air Service experience as one of the largest fixed and rotary wing operators in Japan and a Leonardo Authorized Service Center for decades in delivering charter, goods transport, aerial photography and EMS/SAR services across the nation to identify opportunities for the world’s first multirole / commercial tiltrotor in Japan and offer the AW609 for a range of roles such as transport and EMS/SAR. Their combined fixed/rotary wing operational and service expertise makes Nakanihon Air Service the ideal partner. There are over130 helicopters in service in Japan performing law enforcement, emergency medical service, search and rescue, firefighting, disaster relief, VIP/corporate transport, electronic news gathering and naval utility.